Mitzo heightens its brunch game by offering luxurious items as part of its brunch menu in its latest revamp. There is a menu of bamboo clam, abalone and lobster dishes – and every diner gets to pick one of each! Yes, for the price you pay, it includes one bamboo clam dish, one live lobster dish and an abalone dish each. Such supreme dishes would usually cost a bomb in seafood restaurants; you know that. Just think about the standalone value of these three dishes that you are entitled to in the Weekend Brunch! Choose your desired way of cooking. For the bamboo clams, the range to select from are Steamed Bamboo Clam with Minced Garlic in Soya, Steamed Bamboo Clam with Enoki Mushroom in Spicy Peanut Sauce and Steamed Bamboo Clam with Preserved Vegetables in Soya. We highly recommend the former, which is the classic way bamboo clams are commonly prepared in local seafood restaurants. The sweetness of the clam is enhanced with the fragrance from the soy sauce and garlic. You can choose the way your lobster is cooked as well – Deep-Fried Lobster coated with Truffle Peanut Sauce, Baked Lobster with Creamy Lemon and Cheese, and Spicy Chilli Lobster Served with Bun. The spicy lobster is our pick, for its tangy flavours. The bun (served separately on the side) is for you to wipe up all the remaining sauce. Last but not least, for the Supreme Specialty Dishes, you get an abalone dish. Choose from Abalone Truffles Rice, Stir-Fried XO Abalone with Asparagus and Braised Abalone with Tofu. Save some tummy space for Mitzo’s acclaimed roast meats. While the Crispy Pork Belly with Bun is flavourful and tasty, we cannot miss the Mitzo Special Barbecued Pork. The outer caramelised crust that encased the pork meat is crispy and sweet, and the meat is so tender it melts in your mouth. If you haven’t tried Mitzo’s Special Barbecued Pork, you haven’t lived. And guys, it’s free flow in the Weekend Brunch. We repeat – FREE FLOW! 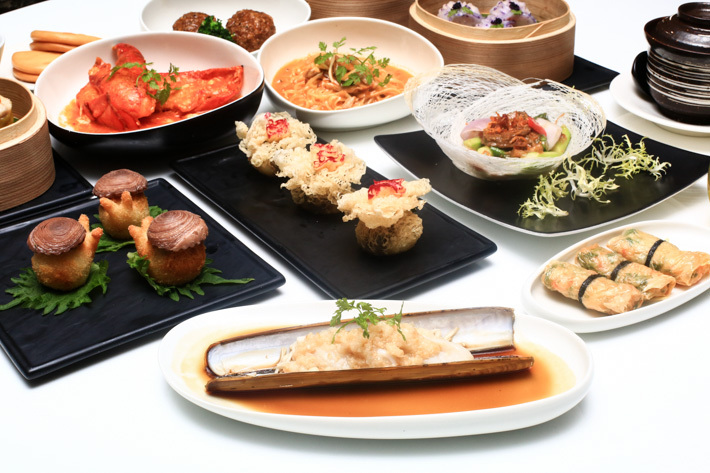 Mitzo’s dim sum selection is among the top reasons why their brunch is so popular, simply because you get to pick from a huge variety of handmade dim sum. One thing Mitzo does really well is to beautify their dim sums. 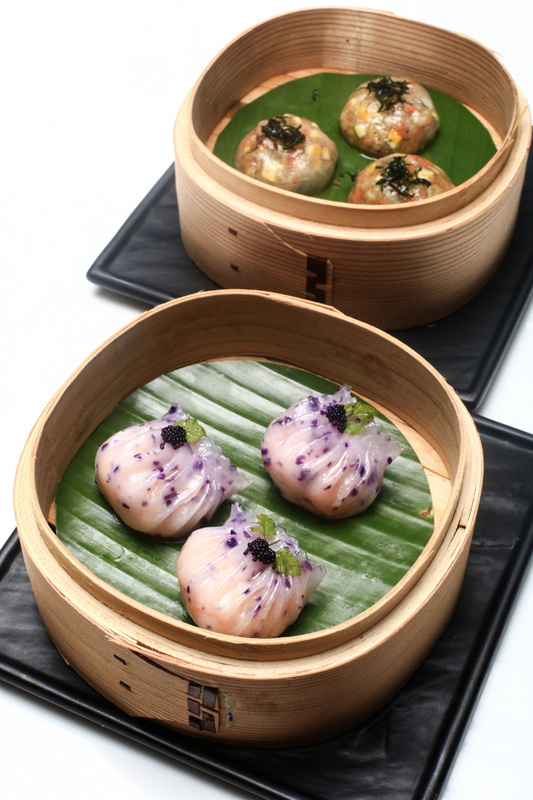 A simple Har Gow (Royal Shrimp Dumpling) is naturally coloured with purple radish for flair, and a creamy custard bun has a charcoal outlook with an edible gold-embossed moon on top. Artisanal dim sum is just about right, and once again, everything’s free flow so you should totally eat to your heart’s content because it’s the weekend! And sure, they taste as good – if not better than they look. Check out this Escargot Cheese Puff which is newly introduced to Mitzo’s weekend brunch menu.. It is a little savoury treat that the kids are bound to love. Who would have guessed that snails could look this cute! When a Cantonese chef cooks for you, of course you have to ask him for his Double Boiled Soup of The Day. The Cantonese do their soups really well, and Mitzo is no exception. Nourishing broths that have been double boiled for hours with premium ingredients, the Weekend Brunch includes unlimited servings of the Soup of The Day that we always look forward to. The Braised Abalone Strips & Bamboo Pith Soup is for those who prefer soups with a thicker consistency. Some other wok dishes to love are the Stir-Fried Scallop with Egg White & Fresh Milk and Crispy Duck Roll. And the Braised Truffles Pork Ball – a Cantonese-style pork ball infused with truffle – is one surprising dish. Hand-beaten meat balls are prepared fresh daily, and the truffle adds fragrance that cuts through the strong meaty smell. While most people stay away from the carb-loaded dishes that fill one up fast, we actually recommend trying the Braised Duck Pulled Noodles. You can always order a portion and share it with your dining partners. The duck is fork-tender and the chefs nailed it with the sauce and well-cooked la-mian. While the elegant Cantonese desserts are prepared with finesse, let’s not talk about anything else except the Hokkaido Milk Cheese Tart. The chefs totally won us over with this new addition to the revamped menu! Little yellow tarts to end off your meal is second to none. Savoury milky cheese custard encased in buttery tart shells; melty and flowy. How to not love these? Eat all you can? Yes, sure. Too easy. Mitzo also has a specialised cocktail bar where you can expect an impressive range of artisanal and bespoke cocktails, including the classic Shisho Mojito, vodka-based Blue Moon and the pretty gin-based Pink Fashioned. Nothing on the menu you fancy? No worries. Just tell the bartender your preference and he will create a concoction specially for you! Mitzo spares no effort in pampering you. Bringing the littlies out to brunch with you? You can just sit back and indulge as Mitzo keeps your little ones entertained in a dedicated kid’s playroom, complete with cartoons, cushioned seats, and a selection of engaging & fun-filled activities.